DD Form 2936 or the "Request For Approval Of Dod Internal Information Collection" is a Department of Defense-issued form used by and within the United States Army. The form - often mistakenly referred to as the DA form 2936 - was last revised on April 1, 2014. Download an up-to-date fillable PDF version of the DD 2936 down below or find it on the Department of Defense documentation website. 1. CLASSIFICATION OF COLLECTION. As stated. 5.d. RELATED INFORMATION COLLECTION(S) (If applicable). Form number, etc.) for any related information collections. digit day and 4-digit year (04/02/2012). e. FORM NUMBER(S) (If applicable). Provide associated form numbers. Manager if the form is awaiting official approval. (RCS) has not been assigned. Complete all sections of this form. but the RCS has expired. Complete all sections of this form. web-based surveys. Select "Information System" for databases. Collections Officer by sending an email to dod.internal.collect@whs.mil. change to the collection instrument, do not complete section 11, etc.). burden and cost on the respondents. this form. Complete all other sections. Director, Defense Manpower and Data Center (DMDC). See section 11.b. attach the justification statement provided with the OMB Form 83-I. description of the revisions instead of composing a justification statement. Attach as part of the DD Form 2936 action package. 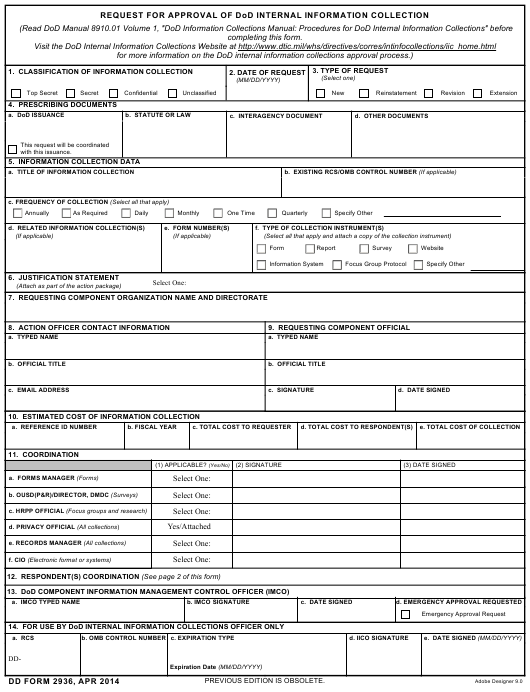 this form if this request will be coordinated with a DoD issuance. necessary. Attach as part of the DD Form 2936 action package. 8. ACTION OFFICER CONTACT INFORMATION. As stated. DD Form 2936 action package. the document as part of the DD Form 2936 action package. coordination (sections 11 and 12 of this form). approval should begin on the DoD Cost Guidance Website at https://www. after cost is estimated using the DoD Cost Guidance Website. b. EXISTING RCS/OMB CONTROL NUMBER (If applicable). Form 2936 after cost is estimated using the DoD Cost Guidance Website. (OMB) control number associated with the information collection. c. FREQUENCY OF COLLECTION (Select all that apply). As stated. estimated using the DoD Cost Guidance Website. sign in section 11.f. (3) if CIO coordination is applicable. order as it appears on this form. applicable to the information collection. (3) DATE SIGNED. As stated. coordinating on the collection (e.g., Navy, USD(AT&L), DA&M). c. COORDINATING OFFICIAL'S TITLE. As stated. for more information on coordinating with responding Components. information collection involves human research. Privacy Official must sign in section 11.d.(2). information collections that may receive emergency approval.